If you have ever run very much at all, you have no doubt encountered a dog of some sort. Even walkers have to deal with this experience from time to time. Hopefully your canine encounter was just checking you out or merely "saying hi" to you. Through the years I have learned the various sounds and body language of dogs which has allowed me not to panick nearly as quickly as in younger "dog years". Without question, the best piece of advice I have ever received about running and meeting a dog was given to me by my oldest brother-in-law (I have four of them – imagine what my car looked like on our wedding day!). Years ago, Tony and I went walking on the Rymer farm (my in-laws) in east Tennessee one evening. A big dog started barking at us. A Rottweiler. (Probably spelled it wrong – don't care.) Tony's voice immediately went about 4 octaves lower than normal. And his open hands went out to either side facing the dog. And something amazing happened. The dog stopped barking and stopped coming toward us. As we talked about what had just happened Tony explained that most dogs cannot stand a person looking them in the eye. They cower away. The hands out to the side make you look bigger than you really are. And they will often turn away. Time for a serious disclaimer here: notice I said that most dogs will back off when you look them in the eye – and they will often turn away when you look at them. Some experts will tell you to never look a charging dog in the eye. I have found that to be best for me and my survival – to look right at them, telling them you are not afraid of them, but you do what you think is best. Understand that there are a few dogs who are going to come after you anyway, regardless of what you do. I read an article one time about running and dogs and the author referred to a scenario of you running and a German Shepherd and a Rotweiler both charging you at the same time. He referred to these as "The Twin Nazis". He also said if they are both coming at you at the same time, well, you may very well have run your last run. So my best advice is don't ever – EVER – find yourself in that position. To this day there are routes around my home that I wish I could take but do not because of the loose dog. I choose not to fight that battle every day, thank-you. I've been "met" by many dogs, but – PRAISE GOD – I've never been bitten. Oh, they've "said hello" to my shoes but skin has never been broken. There were a couple of times that Tony's advice has come in handy – many times actually but a couple of critical ones. And both times it included Dobermans. Once on a street about a mile from home. This family's Doberman was just loose out in their front yard. I was just there in front of him with no place to go and no time to think. So I looked him in the eye, my hands went out to either side with my palms open to him. Then my voice went about four octaves lower and just kept saying "Easy, easy". Then the miracle happened. He stopped his charge toward me, and on his way back toward his house is when he first barking at me. A similar incident happened when I was on a trip checking on some of our student missionaries in Santiago, Chile. 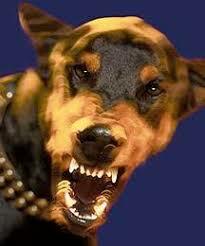 I was running downtown and a Doberman – out of nowhere – came at me. My hands went out and the Lord did the rest. Feel free to use that manuever if the need ever arises. And just say, "Thanks, Tony, wherever you are!" Dogs are a part of running. They just are. Like injuries and "having to go" once in a while. The inevitabilities of life are things we need to accept and cope with. Handling dogs while running has inspired me to face other adversities in life head on. Yet another benefit of running. And another blessing from the Lord to count.